Fakultät für informatik informatik 12 technische universität dortmund Resource Access Protocols Peter Marwedel Informatik 12 TU Dortmund Germany 2008/12/06. 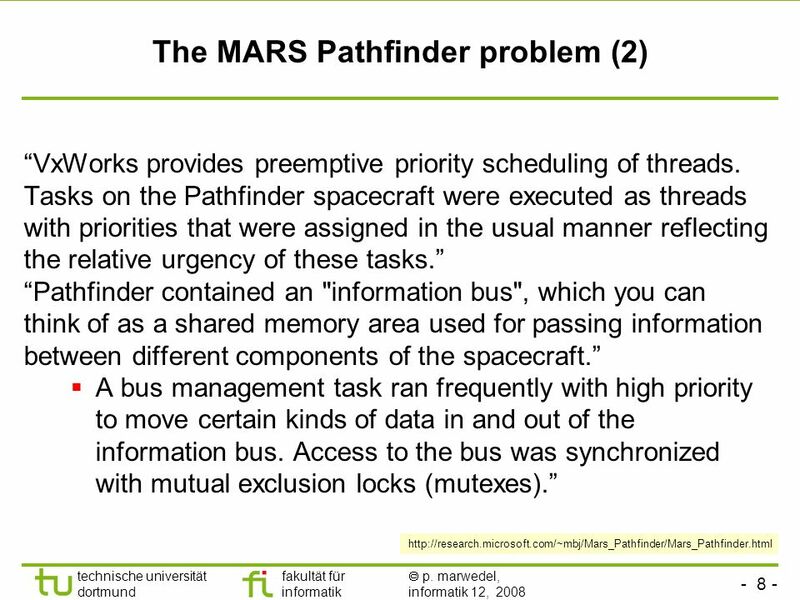 4 - 4 - technische universität dortmund fakultät für informatik p. marwedel, informatik 12, 2008 TU Dortmund Priority inversion Priority T 1 assumed to be > than priority of T 2. 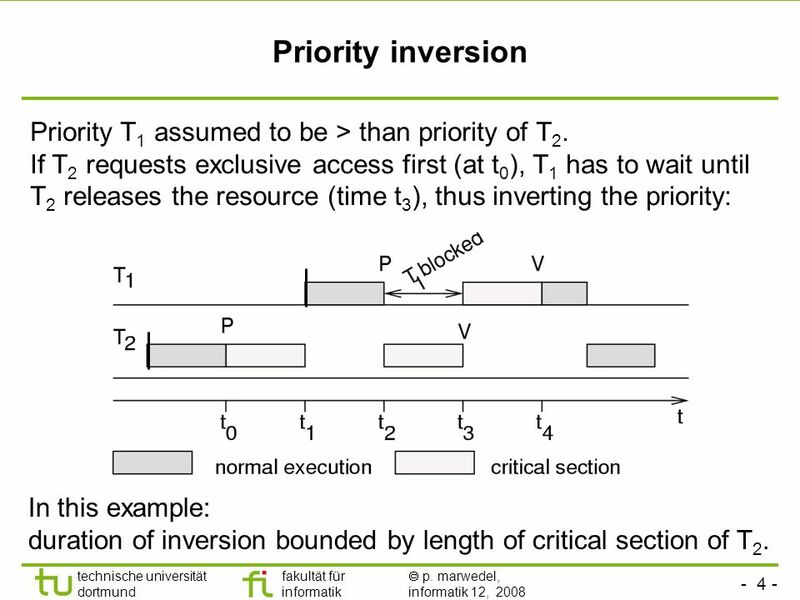 If T 2 requests exclusive access first (at t 0 ), T 1 has to wait until T 2 releases the resource (time t 3 ), thus inverting the priority: In this example: duration of inversion bounded by length of critical section of T 2. 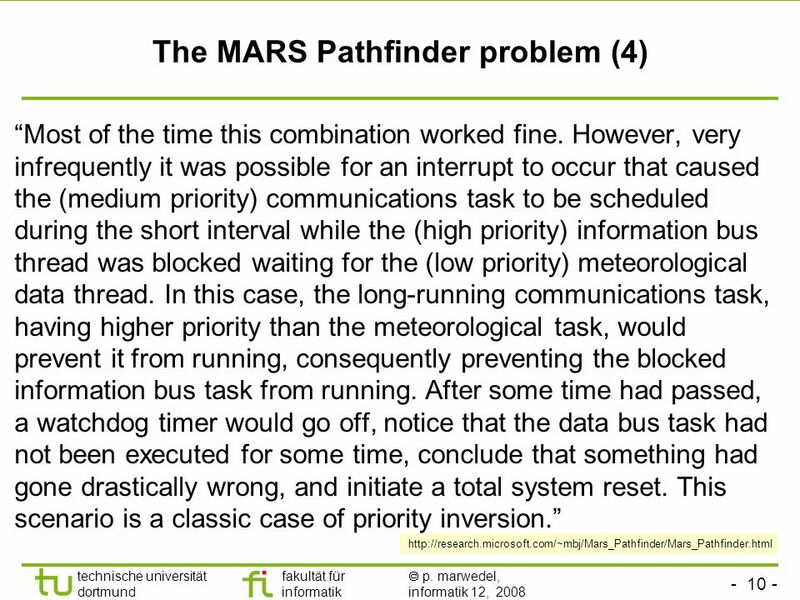 11 - 11 - technische universität dortmund fakultät für informatik p. marwedel, informatik 12, 2008 TU Dortmund Coping with priority inversion: the priority inheritance protocol Tasks are scheduled according to their active priorities. Tasks with the same priorities are scheduled FCFS. 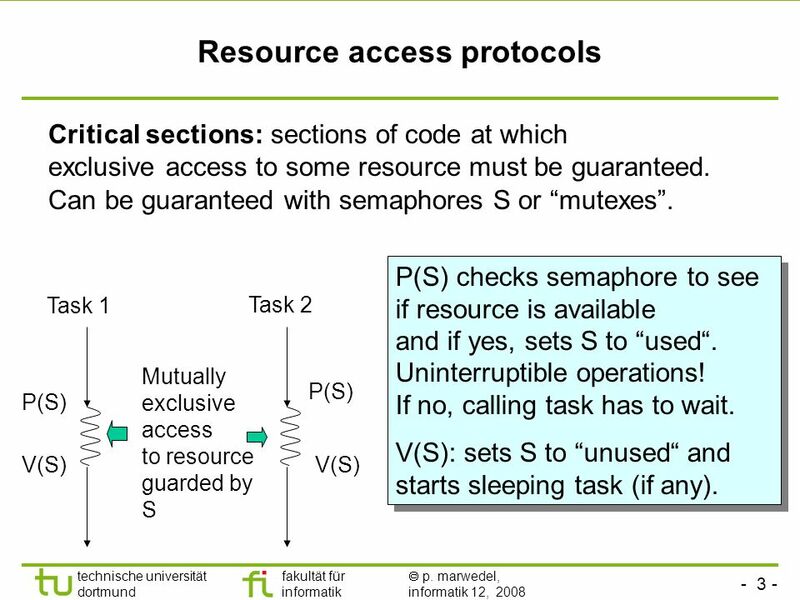 If task T1 executes P(S) & exclusive access granted to T2: T1 will become blocked. 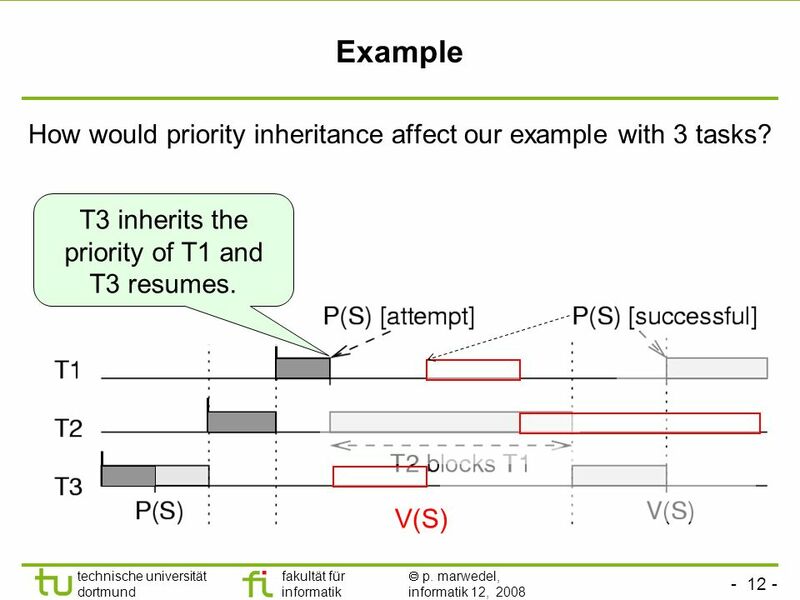 If priority(T2) < priority(T1): T2 inherits the priority of T1. T2 resumes. Rule: tasks inherit the highest priority of tasks blocked by it. 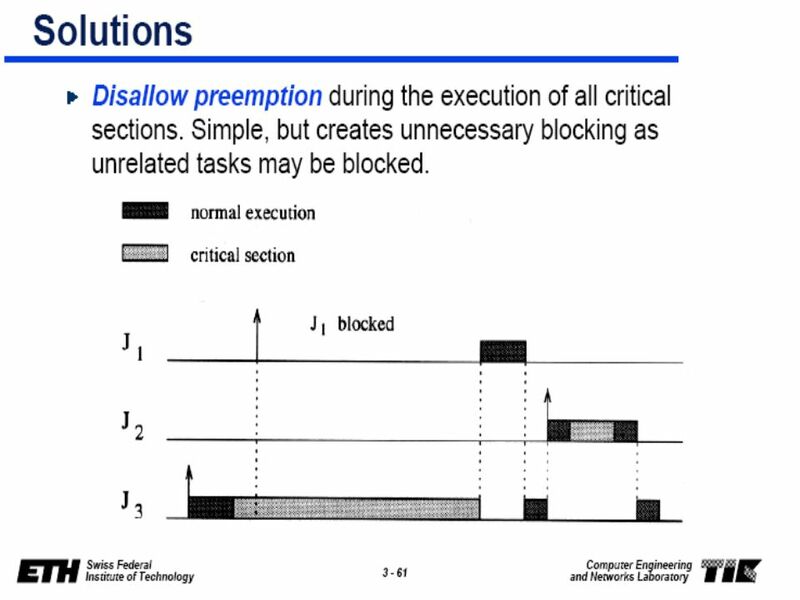 When T2 executes V(S), its priority is decreased to the highest priority of the tasks blocked by it. If no other task blocked by T2: priority(T2):= original value. Highest priority task so far blocked on S is resumed. 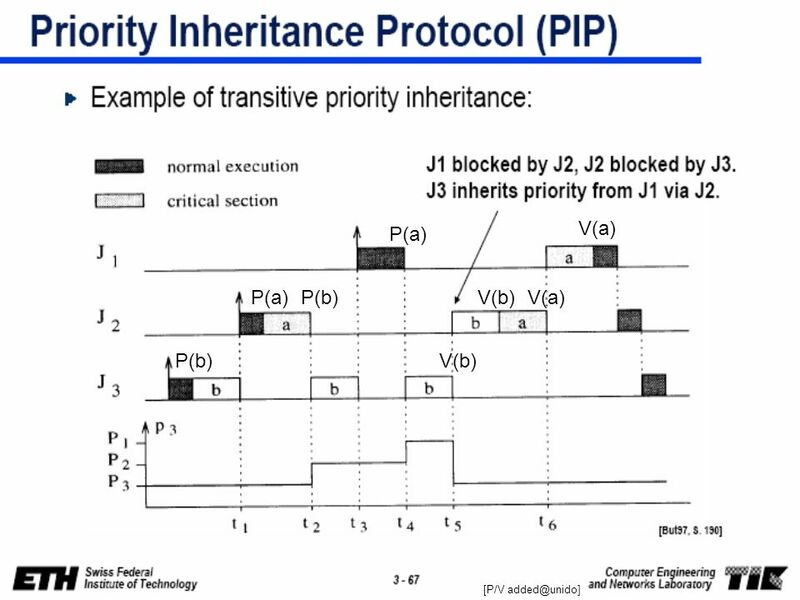 Transitive: if T2 blocks T1 and T1 blocks T0, then T2 inherits the priority of T0. 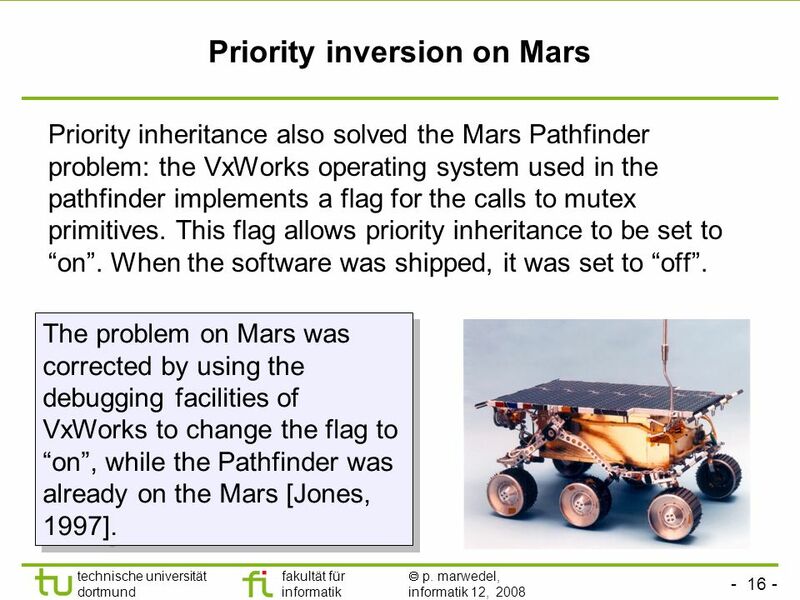 16 - 16 - technische universität dortmund fakultät für informatik p. marwedel, informatik 12, 2008 TU Dortmund Priority inversion on Mars Priority inheritance also solved the Mars Pathfinder problem: the VxWorks operating system used in the pathfinder implements a flag for the calls to mutex primitives. 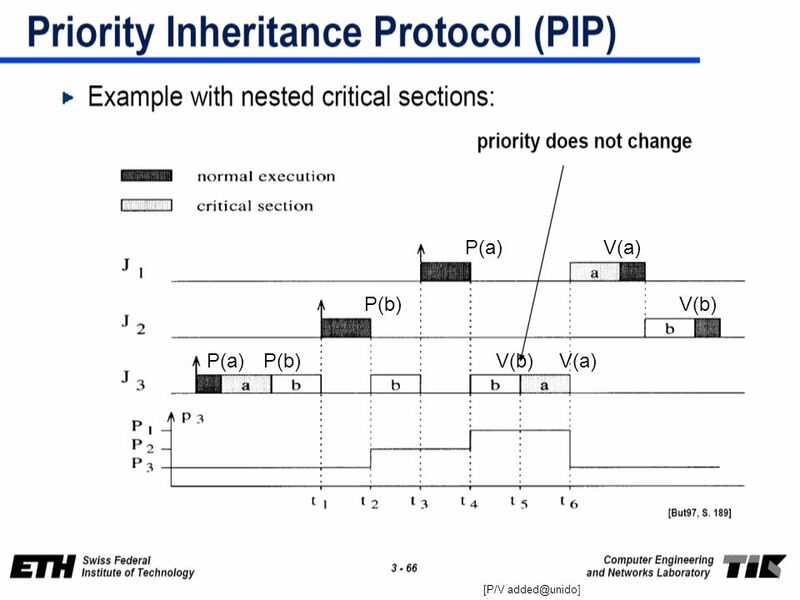 This flag allows priority inheritance to be set to on. When the software was shipped, it was set to off. 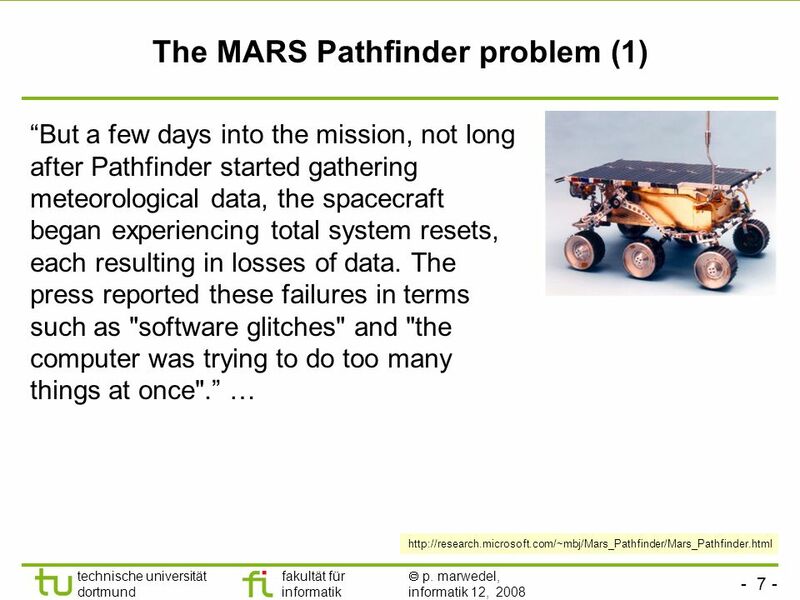 The problem on Mars was corrected by using the debugging facilities of VxWorks to change the flag to on, while the Pathfinder was already on the Mars [Jones, 1997]. 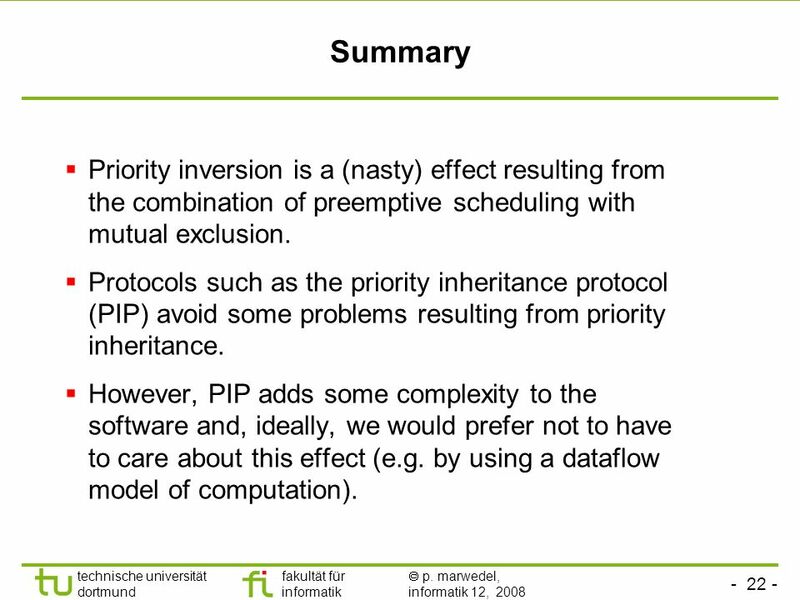 17 - 17 - technische universität dortmund fakultät für informatik p. marwedel, informatik 12, 2008 TU Dortmund Remarks on priority inheritance protocol Possible large number of tasks with high priority. Possible deadlocks. 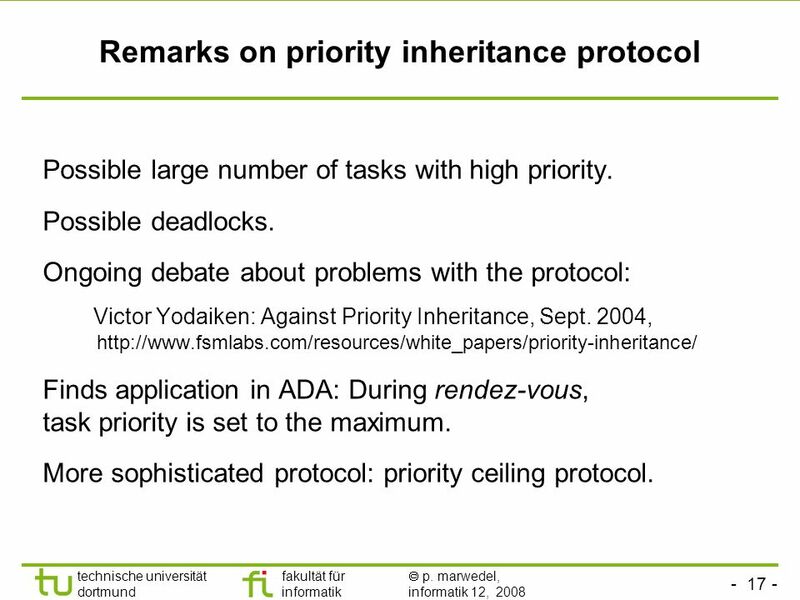 Ongoing debate about problems with the protocol: Victor Yodaiken: Against Priority Inheritance, Sept. 2004, http://www.fsmlabs.com/resources/white_papers/priority-inheritance/ Finds application in ADA: During rendez-vous, task priority is set to the maximum. More sophisticated protocol: priority ceiling protocol. 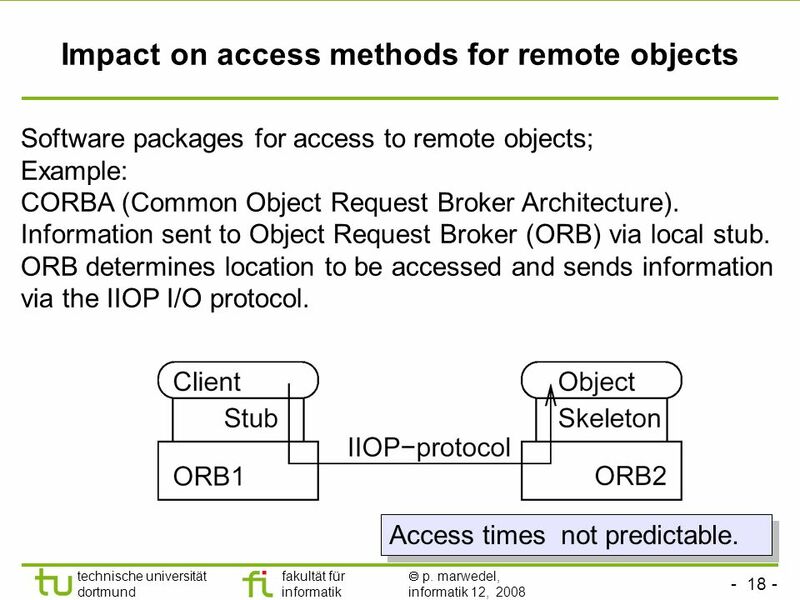 18 - 18 - technische universität dortmund fakultät für informatik p. marwedel, informatik 12, 2008 TU Dortmund Impact on access methods for remote objects Software packages for access to remote objects; Example: CORBA (Common Object Request Broker Architecture). Information sent to Object Request Broker (ORB) via local stub. ORB determines location to be accessed and sends information via the IIOP I/O protocol. Access times not predictable. 19 - 19 - technische universität dortmund fakultät für informatik p. marwedel, informatik 12, 2008 TU Dortmund Real-time (RT-) CORBA A very essential feature of RT-CORBA is to provide end-to-end predictability of timeliness in a fixed priority system. This involves respecting thread priorities between client and server for resolving resource contention, and bounding the latencies of operation invocations. 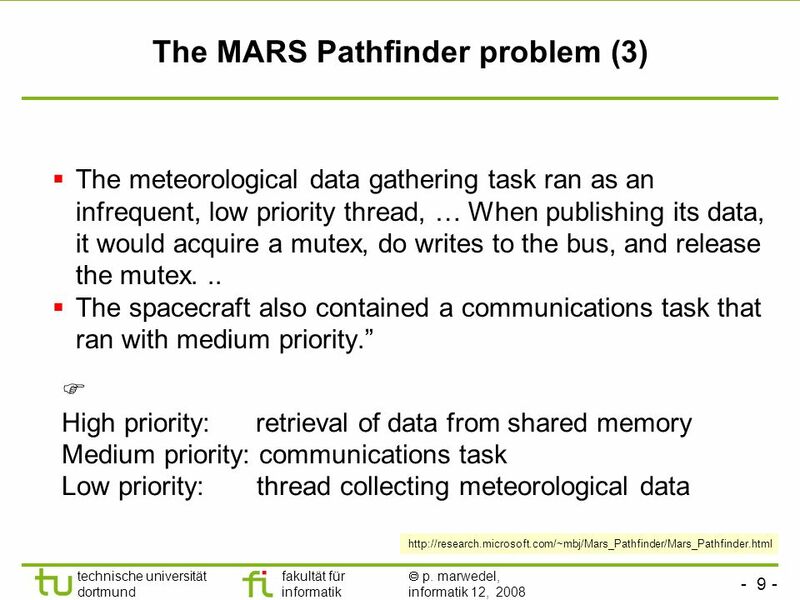 Thread priorities might not be respected when threads obtain mutually exclusive access to resources (priority inversion). 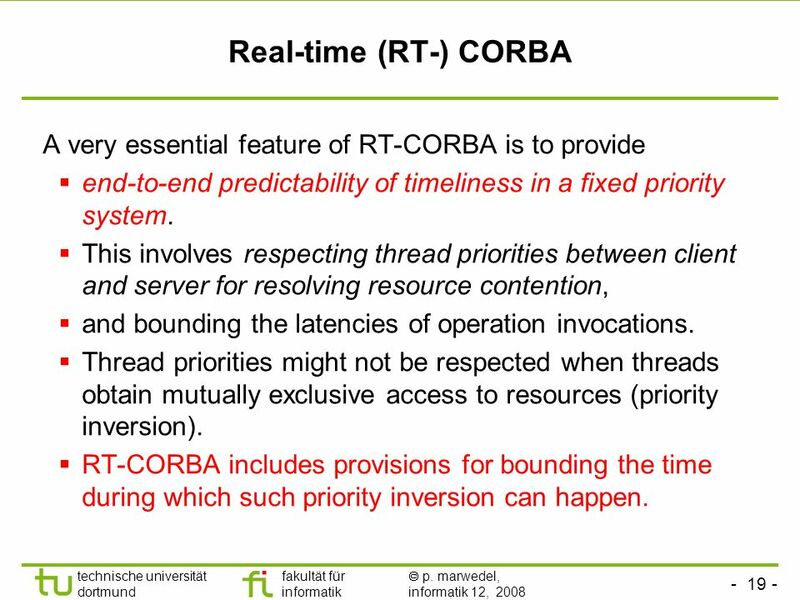 RT-CORBA includes provisions for bounding the time during which such priority inversion can happen. 20 - 20 - technische universität dortmund fakultät für informatik p. marwedel, informatik 12, 2008 TU Dortmund Real-time CORBA - Thread priority management - RT-CORBA includes facilities for thread priority management. Priority independent of the priorities of the underlying OS, even though it is compatible with the RT-extensions of the POSIX standard for OSs [Harbour, 1993]. The thread priority of clients can be propagated to the server side. Priority management for primitives for mutually exclusive access to resources. 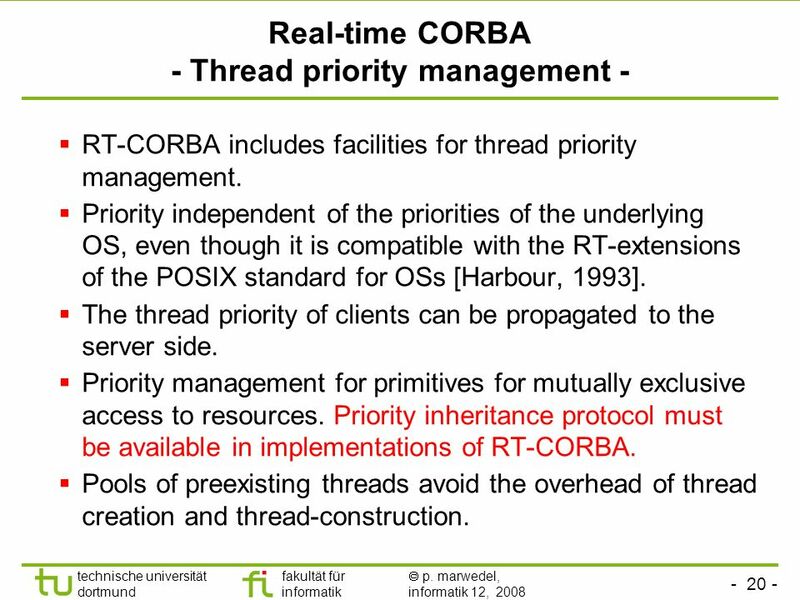 Priority inheritance protocol must be available in implementations of RT-CORBA. Pools of preexisting threads avoid the overhead of thread creation and thread-construction. 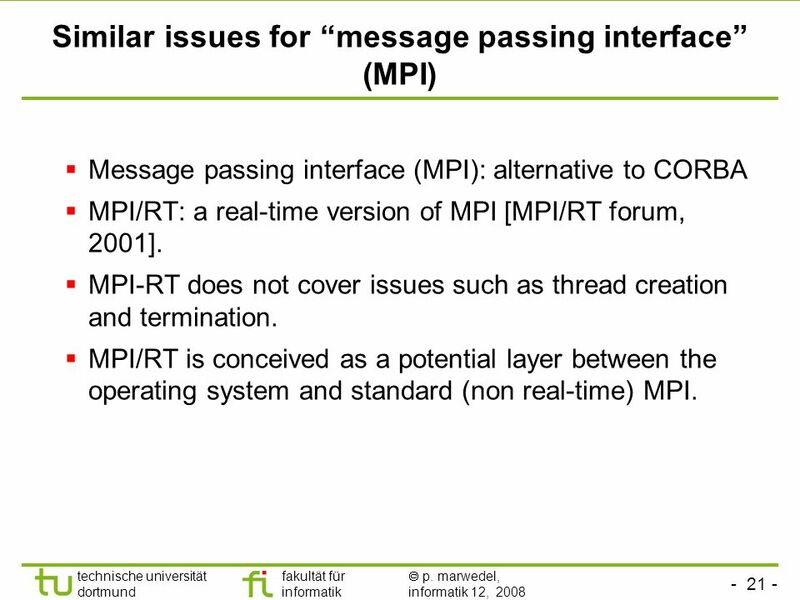 21 - 21 - technische universität dortmund fakultät für informatik p. marwedel, informatik 12, 2008 TU Dortmund Similar issues for message passing interface (MPI) Message passing interface (MPI): alternative to CORBA MPI/RT: a real-time version of MPI [MPI/RT forum, 2001]. MPI-RT does not cover issues such as thread creation and termination. MPI/RT is conceived as a potential layer between the operating system and standard (non real-time) MPI. 22 - 22 - technische universität dortmund fakultät für informatik p. marwedel, informatik 12, 2008 TU Dortmund Summary Priority inversion is a (nasty) effect resulting from the combination of preemptive scheduling with mutual exclusion. 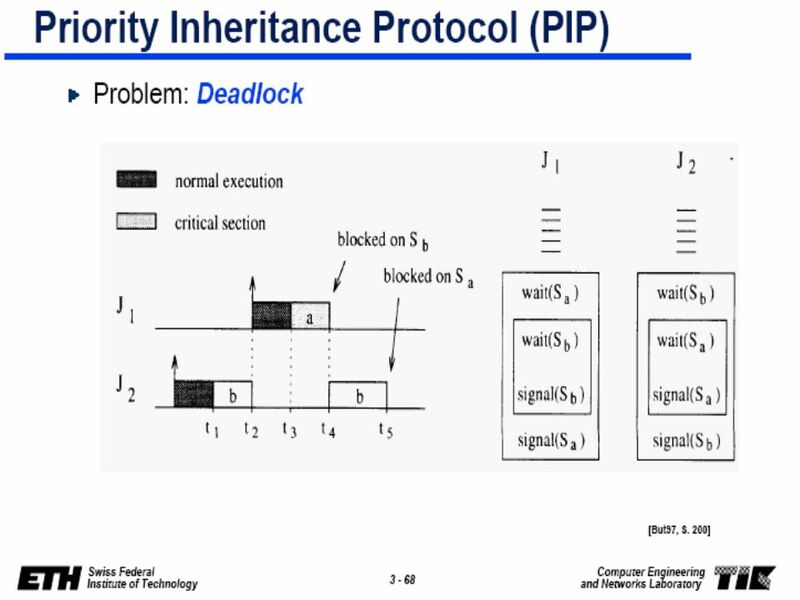 Protocols such as the priority inheritance protocol (PIP) avoid some problems resulting from priority inheritance. However, PIP adds some complexity to the software and, ideally, we would prefer not to have to care about this effect (e.g. by using a dataflow model of computation). 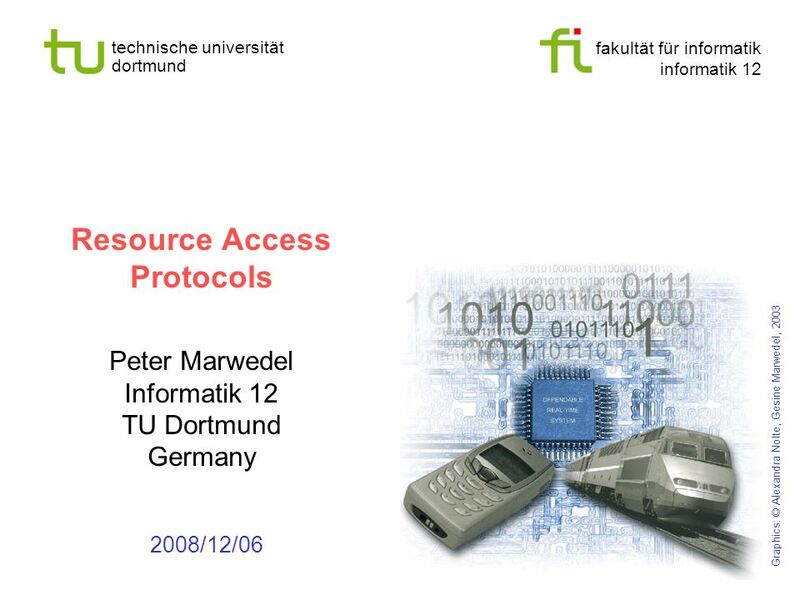 Download ppt "Fakultät für informatik informatik 12 technische universität dortmund Resource Access Protocols Peter Marwedel Informatik 12 TU Dortmund Germany 2008/12/06." Technische universität dortmund fakultät für informatik informatik 12 Models of computation Peter Marwedel TU Dortmund Informatik 12 Graphics: © Alexandra. fakultät für informatik informatik 12 technische universität dortmund Additional compiler optimizations Peter Marwedel TU Dortmund Informatik 12 Germany. Fakult ä t f ü r informatik informatik 12 technische universit ä t dortmund Data flow models Peter Marwedel TU Dortmund, Informatik 12 Graphics: © Alexandra. 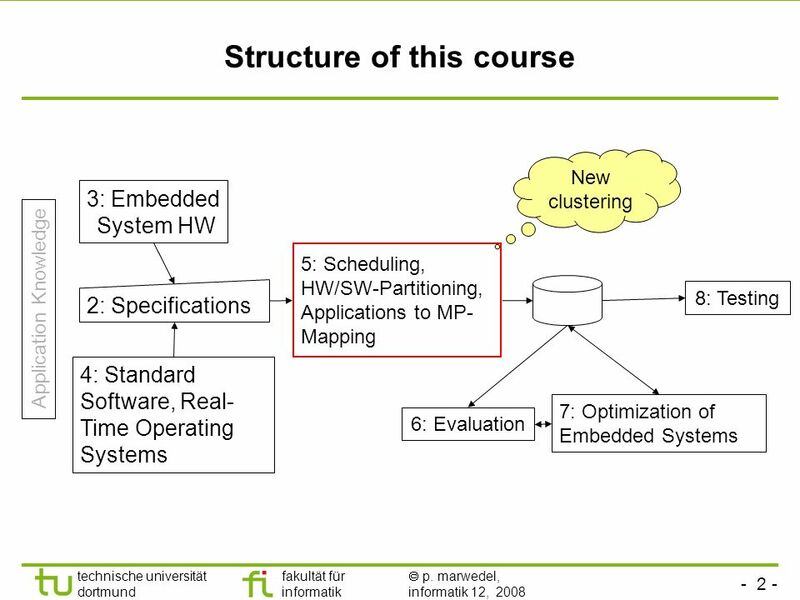 Fakultät für informatik informatik 12 technische universität dortmund Standard Optimization Techniques Peter Marwedel Informatik 12 TU Dortmund Germany. Fakultät für informatik informatik 12 technische universität dortmund SDL Peter Marwedel TU Dortmund, Informatik 12 Graphics: © Alexandra Nolte, Gesine. Concurrency control 1. 2 Introduction concurrency more than one transaction have access to data simultaneously part of transaction processing. 1 Interprocess Communication 1. Ways of passing information 2. Guarded critical activities (e.g. updating shared data) 3. Proper sequencing in case of. Real Time Versions of Linux Operating System Present by Tr n Duy Th nh Quách Phát Tài 1. Chapter 7 - Resource Access Protocols (Critical Sections) Protocols: No Preemptions During Critical Sections Once a job enters a critical section, it cannot. Embedded & Real-time Operating Systems Peter Marwedel TU Dortmund, Informatik 12 Germany Graphics: © Alexandra Nolte, Gesine Marwedel, 2003 These slides.